I like the one about him burying the guy near the house. And also that one die posted. This is still greeeaaaattttttaaaaaaaa! its also reeeeeepoooooooostaaaaaaa! Hahaha! First time I’ve seen that one. Awesome. 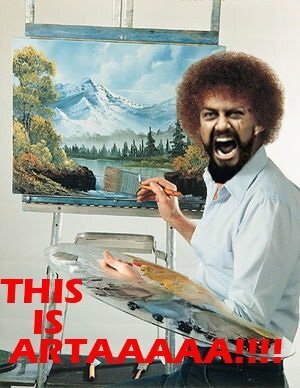 That’s just so wrong, to take Bob Ross’s voice and HAVING IT SCREAM AT YOU!